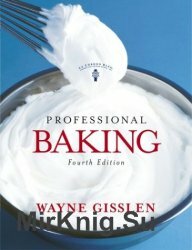 "Professional Baking" brings aspiring pastry chefs and serious home bakers the combined talent of Wayne Gisslen and the prizewinning Le Corden Bleu in one volume. The revised Fourth Edition offers complete instruction in every facet of the baker's craft, offering more than 750 recipes - including 150 from Le Cordon Bleu - for everything from cakes, pies, pastries, and cookies to artisan breads. Page after page of clear instruction, the hallmark of all Gisslen culinary books, will help you master the basics - such as pate brisee and puff pastry -and confidently hone techniques for making spectacular desserts using spun sugar and other decorative work. More than 500 color photographs illustrate ingredients and procedures as well as dozens of stunning breads and finished desserts.